Have you noticed how after years of following a direction you have a change of heart and switch roads unexpectedly? Take for example Jelena of the cute jewelry and wedding accessory design studio Change of hART. She graduated with a degree in Textile Design from FIDM in Los Angeles, CA and worked in field of fine art (painting) and wearable art (painting on silk garments) when suddenly she had a change of heart which lead to changing her art form as well. After a two-year apprenticeship with a jeweler in in Sitka, AK, Jelena emerged as an impressive jewelry designer working mostly with beaded and wire wrapped jewelry. After countless exhibitions, festivals, features in magazines, Jelena opened her etsy shop, where you can find the most amazing of jewelry and wedding designs. Looking at her elaborate works, you cannot miss the elegance and subtle attention to detail that are so often missing in jewelry nowadays. Starting today you have a chance to win this limited edition pair of earrings by change of hART, worth $32! 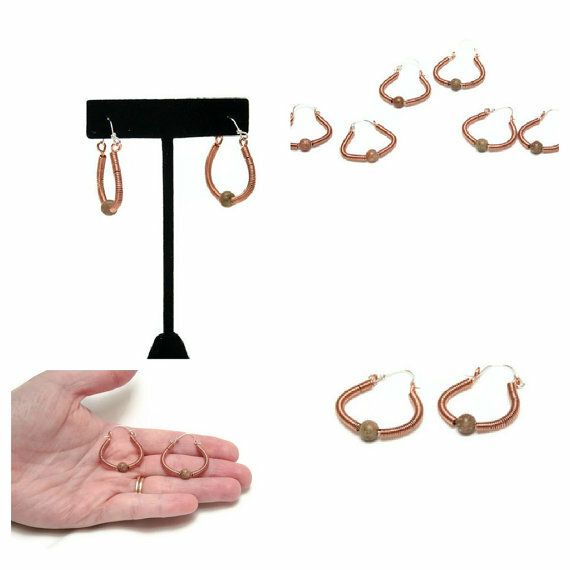 Sterling silver was used for ear wires instead of copper, thus making this piece of coiled wire jewelry suitable for those of you with sensitive ears. 18 gauge copper hoop is encased in copper coil and accented with a 6mm round autumn jasper in the center. This giveaway is open Worldwide until November 7th, 2012. To enter, follow the instructions on the Rafflecopter widget. Thanks for this beautiful giveaway !! I love the Honey Bee Earrings! Wow! These earrings are gorgeous. I don't have much to buy presents this year, and these would be perfect for my Mother in Law! I love the statement necklace. Thanks for the chance. My favorite is the Blue Gemstone Necklace - Elegant Jewelry - Something Blue - Moody Blues Ooak. I adore the Tangerine Necklace - Gemstone Jewelry - Leaf Necklace - Caribbean Summer Ooak!! It is simple and elegant. Love it! You have some nice Judaica jewelry, but I'm addicted to earrings and the Kyanite Earrings - Teardrop Earrings are one my favorites! Great giveaway, these earrings are fabulous! I really liked the Fan Necklace - Shell Necklace - Tribal Jewelry - Mermaid Sun Ooak!! So georgous. I just wanted to thank everyone who stopped by my shop these past 10 days, and I also wanted to thank our amazing blogger, Sonya. It was so much fun doing this giveaway, I am now a fan and follower of Sonya's blog, too. Congrats to the winner, Hana! I will be e-mailing you soon. Also, all of you, wonderful readers and followers, can use coupon 15FORSONYA in my Etsy shop to receive 15% off your entire purchase (with the exception of gift certificates) now through the end of the year.